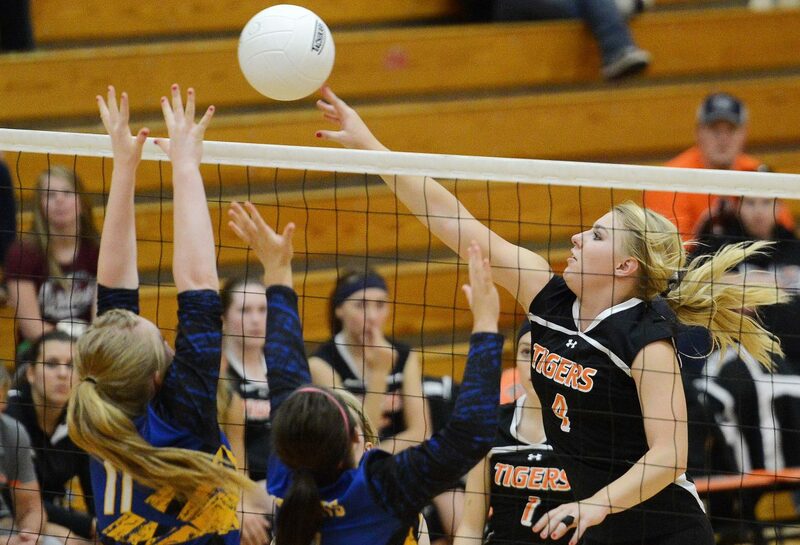 Hayden senior Jordan Temple taps the ball over the net Friday against North Park. The Tigers put together good stretches, but couldn't hold off the Wildcats. Steamboat Springs — Wildly erratic play doomed the Hayden High School volleyball team Friday night, and while the Tigers strung together strong stretches going toe-to-toe with North Park, it wasn’t enough. Hayden lost on senior night falling, 25-14, 26-24, 22-25 and 25-23, in its home finale. Two stretches of points point clearly how well the Tigers matched up against North Park at times, and how poorly they did at others. Hayden started the first set hot and built a big lead, but the Wildcats erased it all and went on to win that set handily. When North Park carried they momentum into a 9-2 lead in the second set, they’d won 32 of the last 40 points. Hayden didn’t go quietly on its senior night, however. The team has two seniors on its roster. Injuries have kept Chancey Graham limited to the sideline for the season, though Friday night she as active as ever, cheering on her team. It was Jordan Temple’s final game, as well, after four years in the starting lineup. She didn’t let go of it easily. She captained the team’s efforts to get back into the match, and the squad certainly did. After that long 32-40 stretch of dismal play, Hayden was back on its game. It came within a hair of winning the second game, then did take the third. Darian Murphy had an ace to help Hayden break out, 20-17. Grace Wilkie had a kill to follow that up. Jewel Vreeman had a key block at 24-19 and Jessika Hockett connected with a strong hit to end the set. Despite more solid play in the final set, Hayden couldn’t keep it up. The Tigers, 4-13, wrap up their regular season Saturday with a trip to De Beque, then play next week in the district tournament.